A Soaring Heaven above Israel? Written by Ariel Kornmehl, Feb 2013. 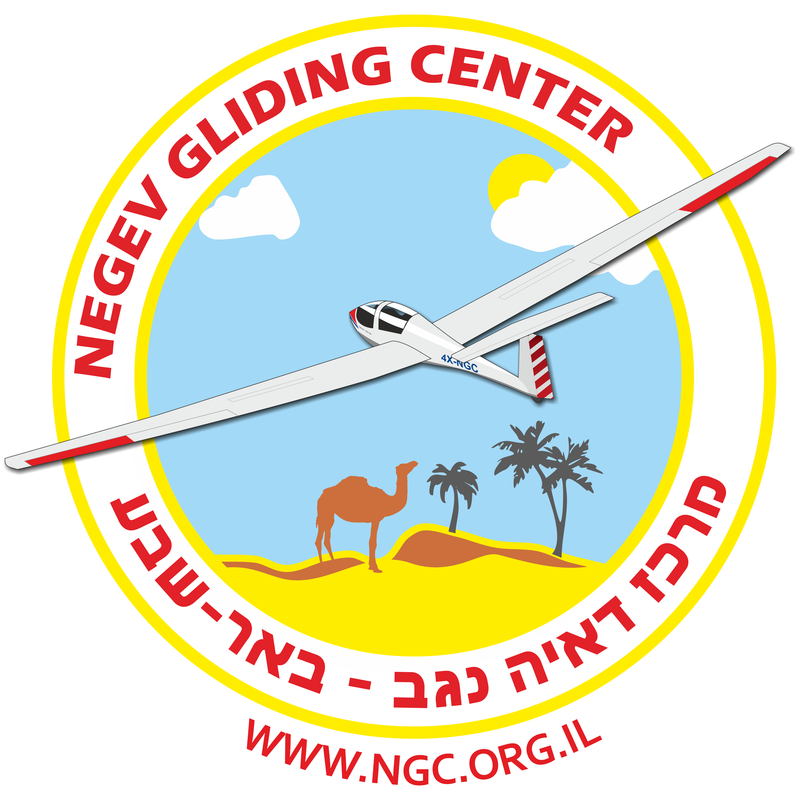 Established in 1965, the Negev Gliding Center is one of 4 gliding clubs in Israel. It is the southeast club, located in "Teiman" airfield, about 7 Km west of Be'er Sheva, on the northern margins of the Negev desert - therefore its name. It’s a member's club or NGO (meaning that all of our activity and rolls - instruction, towing, managing, etc. are executed voluntarily), as with all other gliding clubs in Israel. We currently have about 70 active members. Decisions about future plans and activities are made during our annual club meeting by a democratic vote. We have a 7 member managing board which runs the club's routine. Our fleet contains two tow planes: a Piper Pawnee PA-25 and a Piper Super Cub as well as 7 gliders; 3 of them two-seaters: Schleicher Ka-7 and 2 X Grob 103 Twin Astirs. One-seaters: Grob 102 Astir CS, Schleicher Ka - 8, Edelweiss C30S, Grob Speed Astir. Some of our members have their own private gliders, so there are an additional 10, among them are: DG 505, ASW 20; LS8, Pik 20, Pik 30. Our entire fleet is equipped with FLARMs, new Dittel Radios and LX Electronic Varios. Israel's location is interesting in two aspects. First, its climate is characterized as subtropical. Between the temperate zone and the tropical zone. The northern and coastal regions are characterized by a Mediterranean climate which means hot, dry summers and cool rainy winters, whereas the southern and eastern areas of Israel are characterized by an arid climate. Gliding in Israel is possible year round. Other than a few rainy days in the winter and a few extremely hot days in summer, we can fly around 350 days a year. The second interesting thing about its location is that it is the junction between 3 continents, Europe, Asia and Africa. For this reason, almost the entire bird migration between Africa and Europe makes its path through Israel. Half a billion (500,000,000) birds pass through our skies twice a year, every year. There is nothing like thermaling with a flock of 5000 pelicans or storks. Israel is a small country (about the size of Massachusetts or Belgium) and the air traffic is quite vast. We are only allowed to fly when Israel's Air Force is not flying, which means Fridays, Saturdays and Jewish holidays. Gliding is based here mostly on thermaling. Wave gliding is possible in rare occasions in some places, but since the mountain ridges aren't high, waves aren't very strong and won't get us to more than 12,000 ft -15,000 ft.
Our best gliding seasons are between September to November and March to June. During these times, we have thermals between 5000 ft to 10,000ft. Once or twice a year we may have peak days in which thermaling is possible up to 18,000ft. If you wish to fly with us during your vacation in Israel you are most welcome. Please contact us prior to your arrival. Although numerous restrictions make it impossible for a foreign pilot to fly solo, you will be able to fly with an instructor, so please don't hesitate to call us. Please be sure to bring a hat, sunglasses and closed shoes. As Israel is so tiny, (you can glide from one border to the other in an hour) without noticing it, you might find yourself outside Israel's borders. There are restrictions on some areas within the country, like Ben Gurion International Airport in the Tel Aviv area, Israeli Air Force bases, etc. Therefore, all flights in Israel, including gliding are controlled by the ATC (CVFR) so we must maintain constant radio contact with them (All our gliders are radio equipped). There are talks of also imposing the use of transponders. Quite often we arrange week long soaring camps in autumn and spring. There are a few options for us. In the south of the country, all are in arid desert areas. For example, on the Dead Sea seashore close to the famous archaeological site of Masada. This place is unique because it is the lowest point on earth, about 400 m below sea level. Other places are: near Kibbutz Sde Boq'er (about 40 Km south of our home field) and Ein Yahav (about 70 Km south east). We use these camps as an opportunity to get to know our members and their families better. As the families often join in, we use this time to introduce them to our unique hobby and even take them flying. We prepare meals together and arrange tours of nature sites in the vicinity for anyone who wishes to participate in activities other than flying.